Welcome to Cedars by the Sea! Swing your vacation away on this large wooden swing just at the entrance to the deck. 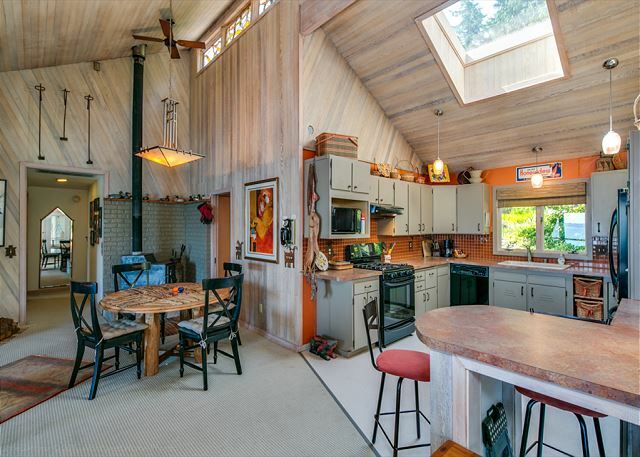 This home offers a vibrant sweeping view of the channel and neighboring islands. On the other side is a beautiful private yard area to enjoy. Welcome inside! Cedars is warmed by whimsy and collectibles. The cute and well appointed kitchen opens to the living room. A beautiful warm kitchen to cook in. Another view of the open kitchen area. It is large, spacious, and well appointed to produce some fabulous meals. Once the meal is done, move from the kitchen to the living room. It is comfortably appointed with immediate access to the deck overlooking the water. Another view of the living room and deck area. Moving to the bedrooms, the master bedroom has a queen size bed and daybed by the window. You can step out the door to the deck and swing. The bedroom also has a patio exit to the porch. The master bathroom is spacious! The second bedroom offers a comfy queen bed and views across the grassy yard to the water. A second view of the second bedroom. The spacious bath offers a jetted tub for those evenings after having fun exploring Lopez Island! Bunkbeds make for additional sleeping arrangements. A washer and dryer side by side are a luxury for longer stays on the island. The parking area is close by the main entrance to the home. Moving outside there's just nothing quite like sitting right next to the water and watching the ferries go by. There are deck chairs too. A sailboat has moored near the house. A short path leads to this quiet beach right below the property. A jagged island shore line becomes visible at low tide. Unique details are a sign of the love and care that is put into the home. 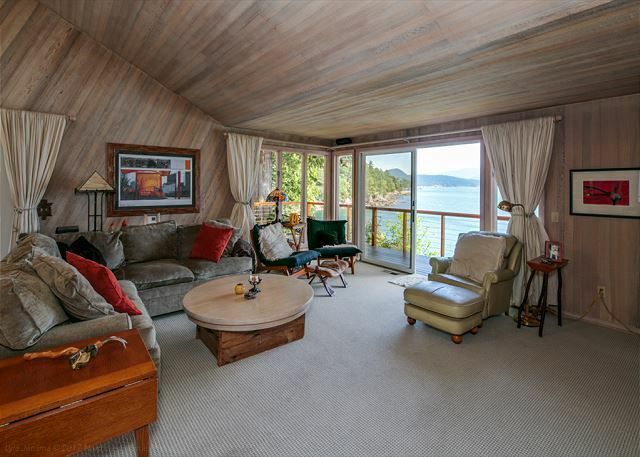 WATERFRONT VACATION RENTAL HOME ON LOPEZ ISLAND, BUOY AVAILABLE. We stayed at Cedars by the Sea for a week in early September and had a wonderful time. 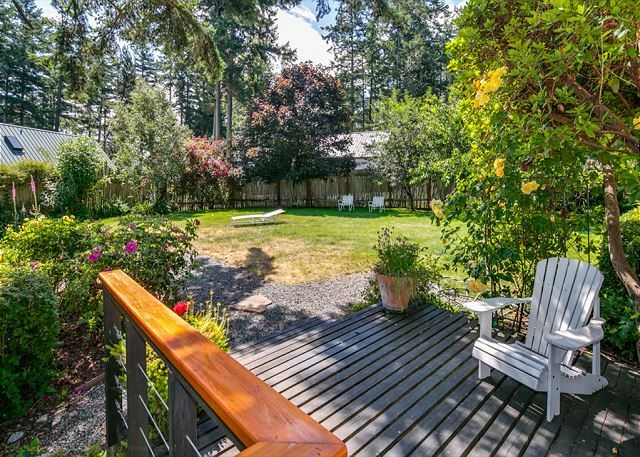 The home is well-stocked and comfortable with expansive views from the main living area and deck. The home is perfect for a couple or perhaps family, but because the only full bath is a "Jack and Jill" style between 2 bedrooms not as conducive for more than 1 couple. We loved watching the ferries, bald eagle, and sea otters from the deck. We also cooked quite a few meals in and found the kitchen to have everything we needed. The home feels very secluded, but can be a little tricky to find especially if coming in when it is dark. All in all a lovely home and would definitely stay here again. The house is on Shoal Bay, which is a sheltered anchorage. There is a new mooring buoy with plenty of depth and an easy dingy ride to shore. Given the tides, you have to tie off and haul your dingy up the beach. If you have more than one boat coming, this is an easy anchorage with depths less than 30'and a mud/sand bottom. The house is up a flight of stairs from the beach and affords a great view of Shoal Bay and your boat. This convenience was wonderful and resulted in lots of cool pictures of the boat on its mooring. The crabbing in the bay is excellent, as is the kayaking. The beach is modest in size and gravelly, but nice to hang out on. And the location is great for popping over to Orca Island, or over to Friday or Roche Harbor to eat and mess around. Lopez Island is the sleepy San Juan Island with very little to do. Which is good if you boat into this house because there is nothing withing walking distance. For groceries, you are better off taking the boat to Friday Harbor. The house is quirky and nice. Clearly lived in by its owners who have decorated it in their own personal style. It was spotless with a nice kitchen (although almost no spices or oils--plan accordingly). The laundry was a godsend after two weeks on the water. It is not a great place for multiple couples because you have to share the only full bath and it opens into both rooms. If that doesn't bother you, then no worries. When we are cruising (usually a month) we always spend around a week on land and in a house. This was a great choice and we will be back. Boating in to a house if fun and a nice break from living in a small space! It was so good- the location is way better than the pictures. The beach is nice and the backyard is so good- we just sat in the backyard for the entire day one of the days. The tub was super gross- the jets are black inside them and nobody would actually use it. And there’s only one shower. But it worked for us. My guests were a family of 3 adults, 2 children who had a wonderful stay in this spacious, clean and comfortable home with great amenities, spectacular view and pleasant yard. This was their first visit to Lopez for a family reunion and they will definitely visit again. Great place, great view, very comfortable enjoyable space for a long weekend. The view was fantastic and the house well equipped and clean. Loved the jet bathtub Hard to find as sign was not visible; don't arrive after dark. Beautiful home for two couples. Overall a wonderful home with beautiful views. I feel the house needs a good deep cleaning, and there were undusted tables etc. I felt like we had to wash dishes before using them and there were not enough glasses. Our family (four kids) had a great time relaxing at the house and enjoying Lopez Island. The beach provides hours of fun. The views from the house are fantastic. Wonderful house and location! My ONLY negative comment is that the neighbor told us that the private beach advertised was, actually, HIS private beach even though it is directly below our house. Also, the buoy supposed to be for our boat turned out to belong to the neighbor. He let us use it for a few days but then he wanted it for his boat. We had to keep our boat in the driveway and find places to put it. Having our own buoy and beach was a HUGE draw for us to this house and that was very disappointing. Had a great time at this location with my family. We stayed for 5 days and the location was perfect for getting around and to and from the ferry. The home was clean and very functional. The view and beach were outstanding. We had an eagle that would perch above the deck and several seals in the harbor just outside. The beach was easy to access. The home had all the necessary amenities and was very comfortable. We'd stay here again for sure! It was a great trip - my wife, her parents and myself - mostly because of the location and amenities offered by this property. From its own private beach on a beautiful, fun and actively-crabbed bay, as well as the level of comfort the property provided with the nice side yard for outdoor activites, a nice deck and all sorts of other nooks and crannies that were interesting. The weather was great, the place was great and we wouldn't have wanted anytime more. Thank you! We use to live on Blakely Island, right next to Lopez. The island is beautiful and easy to get around (with a car). The view is breathtaking and the house is located on a quiet bay. This was an amazing place Lopez Island was just the right spot. Kayaking, bike riding and hiking with such great weather was relaxing and wonderful. The view was spectacular. Restful and peaceful. I did not want to leave. The house was clean and comfortable. This property is breathtaking. There is a tranquility, and peaceful spirit here hard to put into words. We feel so fortunate to have been guests in this memorable home. the location and view were as advertised, if not better. fantastic deck and yard both with amazing views. there are two things that could be improved. first, it was noted the there were some basic cooking items such as olive oil, dried spices etc. however, these were dated from 2011 - 3 years out of date. if noting that these things are available, please make sure they are not 3 years past their use by date. We had two families staying at this vacation home and really enjoyed ourselves. The house layout was great and had about everything that we needed. The views were amazing and close access to the water was great. Thank you to the owners for making it available to us. We have stayed on Lopez Island several times over the course of ten years. We were soo happy to have our rental experience come off without a hitch. The location was literally minutes from the ferry. We had no problem getting into the house and relieved to have it look and feel just like described. We have had some less than stellar experiences in the past and pleased this one was so easy. We look forward to staying again. lovely quiet location in a cove, just minutes to the ferry very good time will be back for sure. The setting of this house is lovely - the eagle watching was spectacular. The house itself had some issues - loose tiles in the kitchen, shower too small, not as clean as we would have wished. The beds were cozy and comfy, as was the seating in the living area. Overall, the experience of being on the island in such a private setting with great views and an overwhelming sense of peace overcame all. We would certainly visit Lopez Island again. One of the most restful vacations I can remember. Nice and cool on the water when it was 103 degrees in Seattle. Perfect place for those who really want to just relax and slow the pace for a while.